There are many reasons I do not update this blog on a regular basis. For one, no one knows about this and therefore, no one reads this...it is just for me. Another reason, I am a really lazy person. Two weeks ago, I got the Wii. This pretty much means that I have been "Wii-ing" the past two weeks. We have had one at work since its release. Once the clock hits five, the gang gets together for our daily dose. After a about and hour or so, we all go home to play on our personal systems at home. Wii is the reason to go to work and to come home. I highly recommend the Wii. If you have one, good. If you do not have one, I suggest you get one or get a friend that has one. I got to keep this short, I must get back to "Wii-ing". Yeah, that is my word, you heard it here first...but you are not even here, whatever. The Calgary Flames honoured on of their best tonight as they retired Mike Vernon's number 30 to the rafters at the Saddledome. This is only the second time the Flames have retired a player's number. On 17 March 1990, the Flames retired Lanny McDonald's number 9. I had to listen to the ceremony on the radio...actually, internet radio. I wish I was there or at least had a chance to see it televised as this is such a rare occasion. Not only is it rare for the Flames to retire a jersey, but Mike Vernon played most of his hockey in Calgary. He not only played his junior, minor, and pro career in the city of Calgary, his was also born in Calgary. Vernon holds multiple records for the Flames, including most games played and most games won in both the regular season and playoffs. Another reason I wish I could have seen this, members of the 1989 Stanley Cup winning team were there for the ceremony. This includes Joe Nieuwendyk, Al MacInnis, Jamie Macoun, Joel Otto, Theo Fleury and of course Lanny McDonald. You can read my other post for Nieuwendyk, but Fleury...Theo Fleury was there! I could go on for days about Theo, but this is Mike Vernon's day. 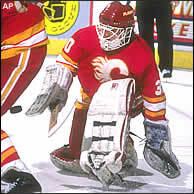 Congratulations to Mike Vernon on a wonderful career, a true Calgarian.